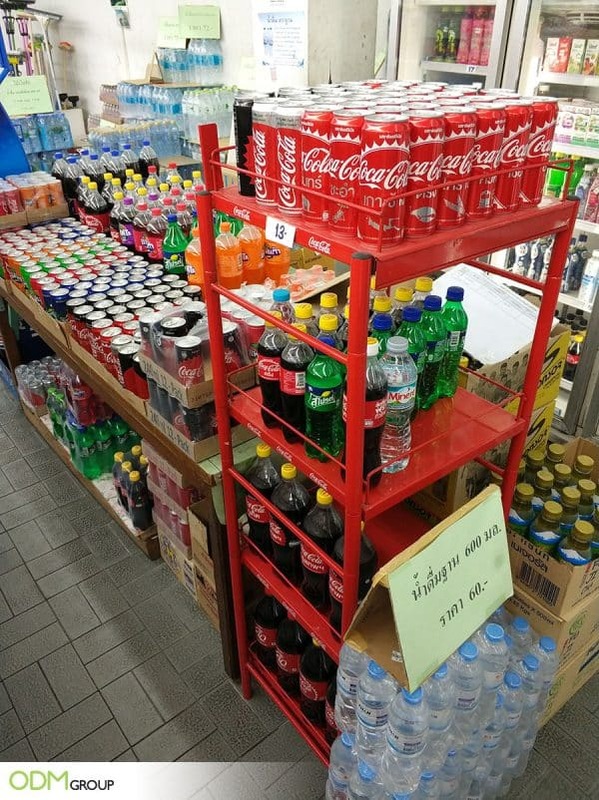 Coca Cola‘s strategy inside a retail store in Thailand can be summed up in one word: simple. The company used a beverage display rack to showcase its line of drink brands. The metal rack comes in signature red hue with its brand name printed on the beams. We found this in the drink and beverage area of the store with other drink brands being sold in bulk. Although it is not as glamorous or as elaborate as other retail displays we have featured before, we can say that it served its purpose very well. But how effective is it? Is The Beverage Display Rack Effective? No Frills Advertising: Straightforward approach highlights the products without distracting the audience with flashy designs. However, it did not have any distinctive feature we can consider remarkable. Functional: The durability of the display rack ensures the safety of the products. In addition, the simplicity of the design allows merchandisers to customize it according to their needs. For instance, adding promotional shelf talkers or wobblers to show prices or announce sale and adding decorations to match the occasion such as Valentine’s Day, New Year, Christmas, and Halloween. Space Saving: Coca Cola’s beverage display rack is just the right size and is not bulky. It’s easy to transport and can be displayed outside the store. The only downside we see with this type of display is that it might not command attention if placed side by side with competitors’ more bespoke display. Although serviceable, the style and design are a bit bland compared to their previous display units. This POS display below is simple, yet it looks more appealing than the one we saw in Thailand. Ideally, you want your products to stand out with a custom display stand or a bespoke POS display. This is important if you want to drive more sales or to boost brand reach. Below are some tips in designing a good beverage display rack for your brand. Use Eye Catching Designs: If you are going to use the display rack for short promo runs and keeping supplies, then a simple one will do. However, to make a good first impression, an eye-catching freestanding display unit is needed. For simple units, make sure that the brand name is easily recognizable like the example we have below. Work With A Reputable Designer: Professionally-designed POS display units can make a lot of difference in your brand image. Seasoned designers will make sure that the style and design complement your brand image. We, at ODM can help you out. Our Mindsparkz team can help design effective and high quality drink POS displays. We also source and manufacture unique promotional products for various industries. Contact our team of creatives today!